Posing as a drug dealer, FBI agent Mike Castro, far right, arrives at a Detroit-area bank. Royal Oak Township police officer Clarence Cooper, second from left, was allegedly recruited by Mayor Coleman Young’s brother-in-law Willie Volsan, center. Courtesy of the Detroit Free Press. In the late 1980s and early 1990s, Coleman Young grew increasingly defiant of efforts to investigate his administration. He denounced the FBI and the news media for engaging in what he described as “witch hunts.” Courtesy of the Detroit Free Press. 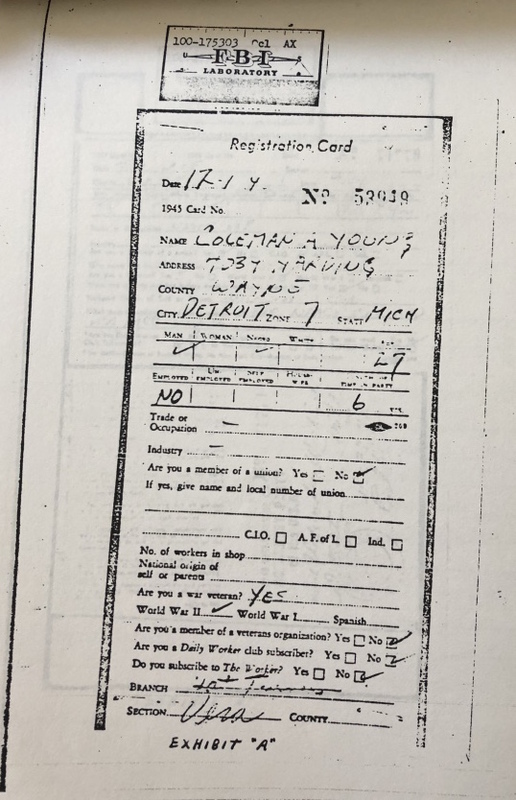 Although Young was always evasive about his Communist ties — he refused to denounce the Party, insisting that it was a valuable ally in the fight against racism — his FBI file includes what appears to be a Communist Party registration card in his name from the 1940s. Federal agents also suspected that he was using the alias “Alexander Washington” in some of his political activities, so the FBI conducted a handwriting comparison between Young’s Communist Party registration card and Alexander Washington’s membership card. The FBI kept tabs on Coleman Young’s public statements concerning communism and labor politics. Here, they took note of statements he made decrying “red-baiting” in the Pittsburgh Courier. 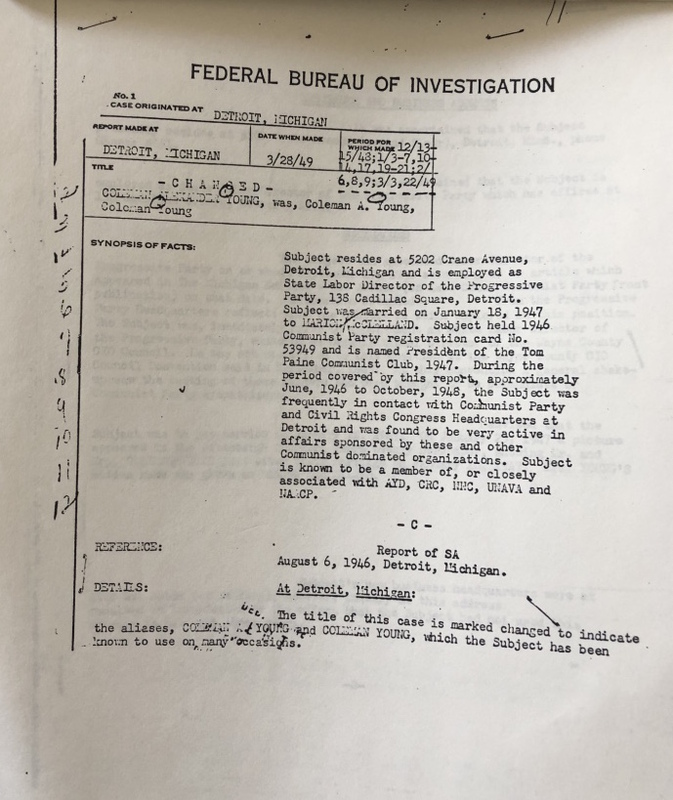 Having labelled Coleman Young a communist, the FBI began monitoring his activities, taking note of his employment, place of residence, and political affiliations. FBI agents would follow Coleman Young to meetings with other Communist Party members. 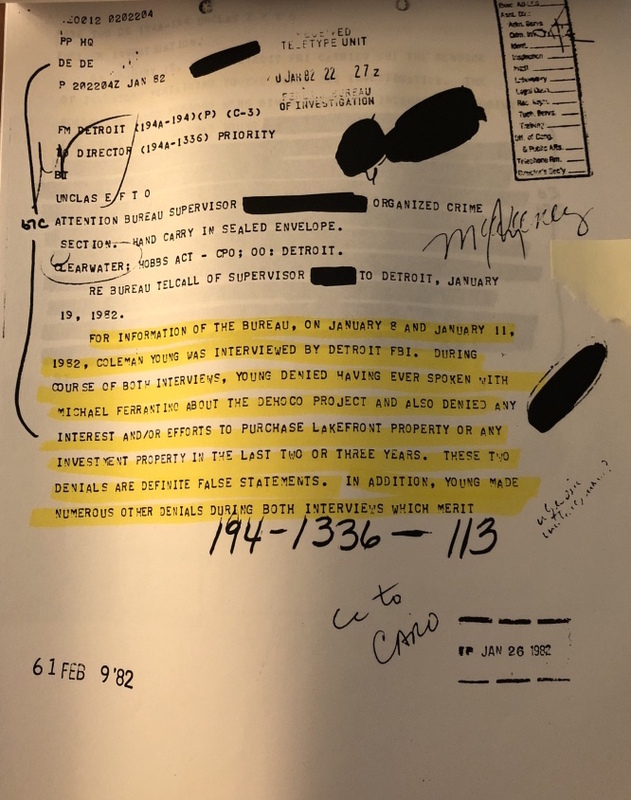 They also had informants inside the Party, as this document indicates. When Coleman Young announced his candidacy for the Michigan State Senate, the FBI alerted the White House that Young, who was “extremely active in the Communist Party,” was running for elected office. After Coleman Young was elected to the Michigan State Senate, the FBI noted that he only attended one meeting of the Freedom Forum Club of the Michigan District Communist Party. The FBI office in Detroit eventually decided it would conduct no further investigation of Coleman Young’s communist activities, since he seemed to have drifted away from the Party. Even after the FBI ceased the investigation of Coleman Young’s communist activities, other FBI investigations of Coleman Young continued well into his tenure as mayor of Detroit. One such investigation surrounded a bid rigging scheme for a city sludge hauling contract. The FBI applied for authorization to tap Coleman Young’s phone communications as part of an investigation into rigged sludge hauling contracts in Detroit. Young had a reputation for taking great care to avoid being recorded; his attorney and longtime friend Mayer Morganroth said that Young would turn the TV on at high volume while having conversations in his office. The FBI never directly tied Coleman Young to the fraud, but they did name him as an unindicted co-conspirator. When FBI Agents Mike Castro and Herm Groman launched Operation Backbone, they first targeted Cathy Volsan. Posing as a cocaine supplier named “Mike Diaz,” Castro took Volsan out to dinner, and she offered to use her connections help him bring drugs into Detroit. Courtesy of Vince Wade. Cathy Volsan agreed to help “Mike Diaz” bring money and drugs into Detroit. For Diaz’s first run, Cathy brought along her father, drug dealer Willie Volsan. Willie tried to rob Diaz, but then agreed to provide him with police escorts to protect future shipments. Courtesy of the Detroit Free Press. FBI agent Herm Groman, pictured here in 2017. 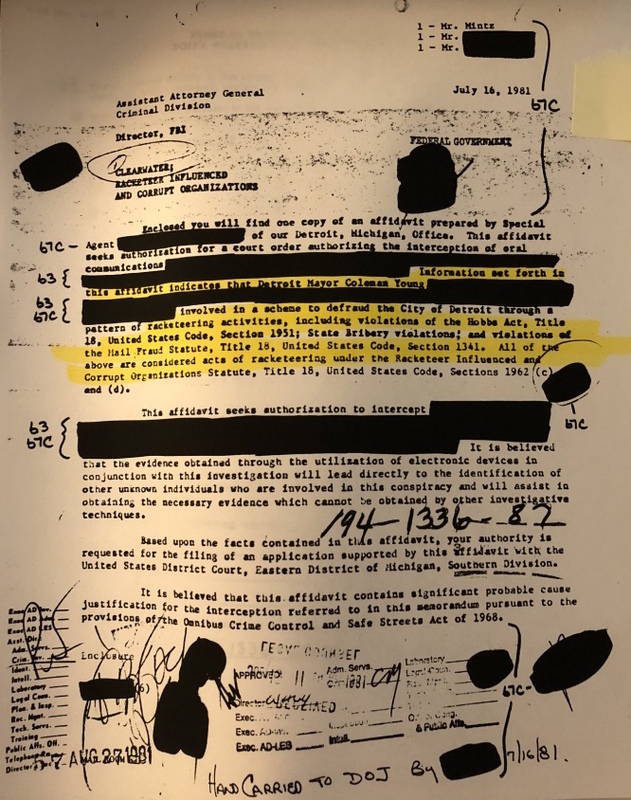 After investigating the murder of Damion Lucas, Groman suspected that Cathy Volsan’s connections with the drug world, the Detroit Police Department, and Mayor Coleman Young had something to do with the cover-up. Courtesy of the Detroit Free Press. Willie Volsan recruited Sergeant Jimmy Harris, above, to help “Mike Diaz” fly money and cocaine into Detroit. Harris had been in the Detroit Police Department since the early 1970s, when he was one of the few black officers in the controversial STRESS unit. From his years on the force, he knew many other cops who were willing to help with the shipments. Courtesy of Jimmy Harris. FBI agent Mike Castro, left, invited Sergeant Jimmy Harris and Willie Volsan to Florida to talk business. Along with another undercover agent, he hatched a plan with Harris and Volsan on a yacht that was outfitted with undercover video cameras. In an undercover recording of the meeting on the yacht, Sergeant Harris offers to use his police radio to direct any interfering cops away from the cocaine shipments. Sergeant Jimmy Harris, left, is shown taking $50,000 from undercover FBI agent Mike Castro, who was posing as drug dealer “Mike Diaz.” Courtesy of the Detroit Free Press. In 1991, surrounded by a phalanx of media, Sergeant Harris tries to pull away from a court officer just before being released on bond. Courtesy of the Detroit Free Press. In 2004, Sergeant Harris began to communicate with Martin Torgler, one of the FBI agents who worked on Operation Backbone. In this letter, attorney James Craven outlines Harris’s claims that Gil Hill did indeed provide investigative information to Cathy Volsan regarding the murder of Damion Lucas. Courtesy of Jimmy Harris. Jimmy Harris was pardoned by President George W. Bush in 2008, thanks in part to the written support of FBI agent Martin Torgler. Courtesy of Jimmy Harris. Crimetown is Marc Smerling and Zac Stuart-Pontier. This season is made in partnership with Gimlet Media and Spotify. This episode was produced by Rob Szypko, Ryan Murdock, John White, Soraya Shockley, Samantha Lee, and Austin Mitchell. The senior producer is Drew Nelles. Editing by Zac Stuart-Pontier and Marc Smerling. Fact-checking by Jennifer Blackman. This episode was mixed, sound designed, and scored by Kenny Kusiak. We’ve added a Crimetown companion playlist on Spotify. We’ll add songs on Mondays to complement each new episode. There’ll be Detroit classics from Motown to hip hop, tracks we used in the episodes, and other songs about the Motor City. Head over to crimetownmusic.com to check it out. Original music this season composed by Homer Steinweiss. We recorded some original music at Rustbelt Studios in Detroit in partnership with Detroit Sound Conservancy. Special thanks to Carleton Gholz and Maurice “Pirahnahead” Herd. Additional music by Kenny Kusiak, John Kusiak, Jon Ivans, and Benny Reid, and additional mixing by Bobby Lord. Our theme song is “Politicians In My Eyes” by Death. Our credit music this week is “Cash Flow” by Detroit Soul Ambassador Melvin Davis. Archival research by Brennan Rees. Show art and design by James Cabrera and Elise Harven. Thanks to the Detroit Free Press, Peter Bhatia, Jim Schaeffer, Mary Schroeder, Mary Wallace, the Walter P. Reuther Library at Wayne State University, Melissa Samson, the Charles H. Wright Museum of African-American History, the Detroit Historical Society, Brendan Roney, Kevin Dietz, Zak Rosen, Martin Torgler, Ralph Musilli, Evan Hughes, and everyone who shared their stories with us. Detroit is an amazing place, and we’re honored to tell a small part of its story.